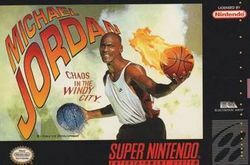 Michael Jordan in Chaos in the Windy City was released by Electronic Arts in 1994 for the SNES. The game did not sell well and was named in the top ten worst video games in Nintendo Power magazine. It features Michael Jordan, though unlike the similarly themed Shaq-Fu, it is a 2D platformer along the lines of Mario. The game plays much like other 2D platformers of its time, with goals including collecting keys and defeating enemies with a variety of different techniques. The player controls Michael Jordan on a quest to save the rest of the players for an All-Star charity game, who have all been kidnapped by a mad scientist named Dr. Maximus Cranium. The player attacks enemies using different basketballs, each with its own ability; for example, the freeze ball can freeze the ground to create a slippery surface or freeze enemies in a crystallized ball, the golden ball has homing effects, and so on. The player must find keys throughout the game to unlock different doors and rescue teammates. Michael can also slam dunk for a secondary attack that doubles for a way to interact with the various types basketball hoops littered throughout levels. This page was last edited on 12 August 2008, at 04:40.